Committed to helping Airmen and their families enjoy the great outdoors while gaining an appreciation for our host nation and its culture. Easy if you stay on the flat plain. The castle has moderately steep inclines and loose rocky footing around the castle. According to the sign posted near the entrance by the Ministry of Culture and Tourism, “The Kastabala (Hieropolis) Ruins is the most important antique city in the area with its street with columns, amphitheater, basilicas, church and bath ruins and castle. 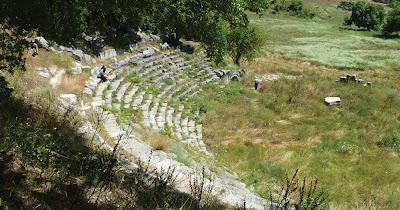 Antioachas named the city “the Sacred city” due to the temple of Perasia who had been adored for a long time in the city. 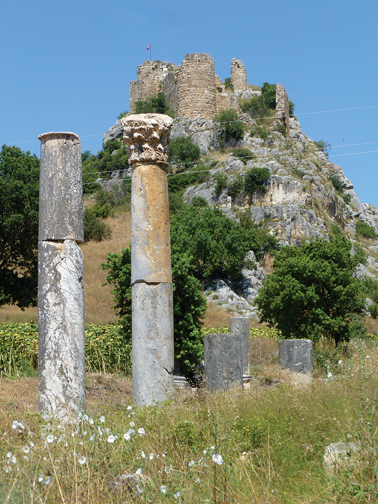 During the Roman and Byzantine empires, this was one of the most significant centers in the region. It was also a religious center during the Kastabala period. In 431, the city participated in the consul in Ephesus. It was very badly damaged in the earthquakes of 524-561. Kastabala, overpowered by Ramazanoğullari in the 14th century, lost its importance. Taken from the Turkish Ministry of Culture and Tourism website. The ruins seen at Kastabala historic site today are all from the Roman Period. The colonnaded street of 300 meters was built around 200 A.D. Follow alongside the row of Corinthian columns and you’ll notice sprawling ruins to the right and left, many with beautiful inscriptions. To your right are the ruins of a Roman theater and baths, and an early church whose “remains are from 5/4th centuries A.D. Its architectural elements are taken from the Roman Empire era buildings that were used in its construction. Around the city there are many tomb structures and rock tombs. 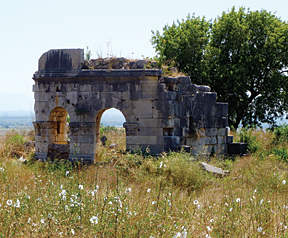 The water supply of the city was taken from the spring near Karagedik village on the eastern shores of the Ceyhan river and transferred through the channels and carried over the aqueducts built over the Ceyhan near Nergis and brought into the city. During the late Roman Period up to the 5th century A.D. a rich olive oil boom was observed in the Karatepe and Düziçi regions. Press stones and remains of mashers, which are evidence of olive oil production, can be seen throughout the region. The olive oil was most likely collected at Hieropolis - Kastabala and from there taken down to the ports of the Issos Bay. A great number of inscriptions and coins were discovered at Hieropolis-Kastabala from the Roman Period belonging to the Roman governors as well as to the independent kingdoms which were established at that time. These independent kingdoms existed at Kastabala from around the second half of the 1st century B.C. until the 17th century B.C. 39th Force Support Squadron / Outdoor Recreation, Incirlik AB Turkey. Watermark theme. Powered by Blogger.